The wonderful Live Art Development Agency, led by the inspiring Lois Keidan, is ten years old. LADA invited a number of artists to make editions/projects for their birthday and these editions went on sale yesterday at their online bookstore Unbound alongside its usual selection of cool and interesting books. Contributing artists to the presents series include Franko B, Hayley Newman and Richard Dedomenici as well as myself, each of us has created the work around variations on the number ten in terms of editions or prices. The presents range from mass produced, cheap and cheerful stuff, to limited edition artworks. My project Heroes & Heroines of Live Art (First 110) takes the form of T-shirts celebrating the names of 110 artists from (and around) the Live Art canon. Each unique shirt bears the name of an artist rendered in a “suitable” (or not so suitable!) typeface. 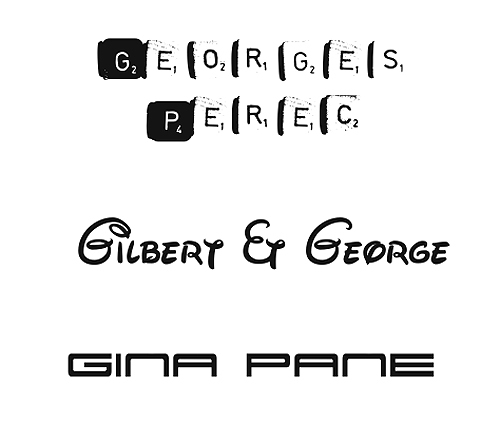 Only one of each shirt – ethically made 100% cotton and with vinyl cut lettering – will be produced. Last time I looked Jack Smith and Marina Abramović had both gone already but Bas Jan Ader remained. Maybe he’ll be the last to disappear. The shirts cost £25 and come in S, M and L. Full list of the artists included on the t-shirts here, the other presents and editions are here. This one here, by Anne Bean, is esp nice. My performance project Sight Is The Sense… with the amazing Jim Fletcher has presentations in the UK this week. Bristol and Leeds are done already and are followed by Nuffield Theatre Lancaster (Thursday) and Site Gallery Sheffield on Friday. More tour/gig details here. And a nice Guardian review here. 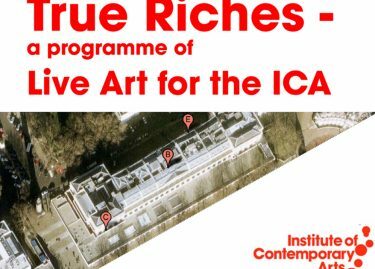 Finally the project True Riches: A Programme of Live Art for the ICA is launched tomorrow (Wednesday). It’s a collaboration I’ve been working on with Ant Hampton (Rotozaza) and was started in reaction to ICA Director’s Ekow Eshun’s decision last year to close the Live Art Department at ICA London. Ant and I have now (virtually speaking) re-opened the Department through this independent curatorial project which includes contributions from an international group of artists, curators and thinkers working in and around Live Art. We hope the True Riches programme – downloadable from the project’s web site here – shows off some of the range, energy and dynamism of contemporary live art practice and belies last years closure. A second season of (virtual) work is planned for later in the year. True Riches #1 features contributions from: Geraldine Pilgrim, José Antonio Sánchez, La Ribot, Gary Stevens, Vivi Tellas, Nicolás Goldberg, Christine Peters, Yara El-Sherbini, David Rosenberg / Shunt, Rajni Shah, Bill Aitchison, Goran Sergej Pristas, Frauke Requardt, Momus, The Centre of Attention, Duckie, Lois Keidan, Borrowers-International-Network, Hannah Hurtzig, Home, Zhana Ivanova, Station House Opera, Janez Janša and Stefan Kaegi.